Nails of the Day: "Be Your Own Anchor"
Yes, I just quoted Teen Wolf in a nail post, stranger things have happened. 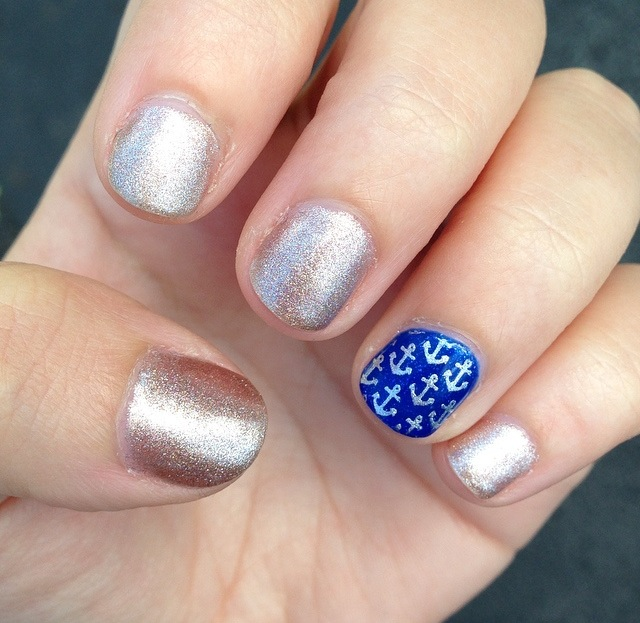 That's really the first thing I thought when I used an anchor stamp on my ring finger for this mani! That quote was actually one of my favorites from the show and always seemed to make me feel better whenever it came to mind. Anyways let's move on, I apologize for the lack of nail posts this past month! I just haven't had any inspiration when it comes to my nails so I left them naked for the past month and a half! No wonder my life felt like it was going out of control haha. In my mind, nice nails are a sign that your life is together. For this look I used Gelish "Oh What a Knight!" which is a shimmery rose gold color from their Once Upon a Dream collection. The accent nail is Gelish "Mali-blu Me Away" from their recent summer collection Colors of Paradise. These are really the only two colors that I liked from their past two collections this year but hopefully I'll be getting a few colors from the fall collection. Who can resist fall colors? !